A recap of the destruction of the partnership and the friendship of Johnny Gargano and Tommaso Ciampa. A good match. This was a nice debut for Bobby Fish. I kind of like that they didn’t go for the typical thing where the debuting guy gets an easy win. Fish looked good, though he’s obviously got a lot more to show. I think this starts him off well in NXT. It gives him space to grow as a character. Last week, Hideo Itami was pissed at Kassius Ohno and blames him for their loss in their tag match. Ohno is frustrated with Itami always blaming someone else. Ohno is done talking, and he’s done trying to reach out to Itami. The Street Profits are coming to NXT. Two weeks ago, Kayla Braxton attempted to interview Velveteen Dream. He wasn’t having it though. This was very short, so neither woman had much of a chance to show a lot of what they can do. There wasn’t anything wrong with the match, there just wasn’t much to it. Last week, Alexander Wolfe and Killian Dain attacked Drew McIntyre in the parking lot. Bobby Roode suggests to William Regal that Killian Dain should face Drew McIntyre since they are both currently undefeated. Regal likes the idea, so he makes the match. Regal also makes the stipulation that the winner of that match will face Roode for the title at Takeover: Brooklyn. Roode simply smirks and walks away. Johnny Gargano heads to the ring. The crowd welcomes Gargano, something that Gargano very much appreciates. Gargano says he used to get excited about hearing his music and heading to the ring, but Ciampa’s betrayal has confused and hurt Gargano. He doesn’t understand why Ciampa did what he did, but Gargano won’t dwell on the past. He’s going to move forward and get back to doing what he loves to do. He vows to wrestle at Takeover: Brooklyn. He’s going to be Johnny Gargano again, but even more than that, he’s going to be Johnny Wrestling. This was a good big-man match. It was made enjoyable mostly by what Otis Dozovic did in the ring. He was definitely he star of this one. He showed his immense power by doing things like hitting an overhead belly to belly suplex on one of the Authors with relative ease. He was a lot of fun to watch in this match, even though the match itself was probably just alright. Nikki Cross, Alexander Wolfe, and Killian Dain comes out to the stage after the tag title match. Pages from a book fall from the ceiling as SAnitY stares at the Authors of Pain in the ring. This was a pretty good show. The title match was s slight surprise in that Dozovic really stood out and made it fun, and the debut of Bobby Fish was nice. I liked the action better in this one more than in the main event. 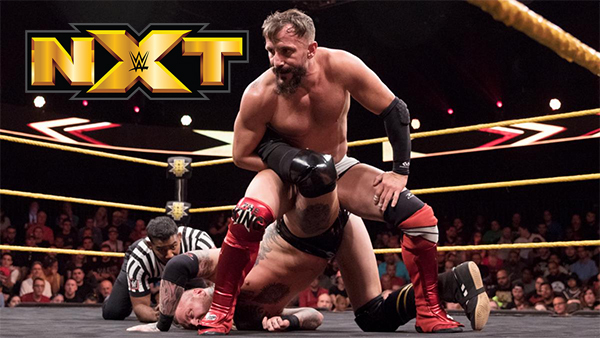 I think both Black and Fish will have better matches, and I’m sure the excitement of seeing Bobby Fish in NXT is swaying my opinion a bit, but this was a good match.